The Best Grill Cart and Why it May be Right For You. 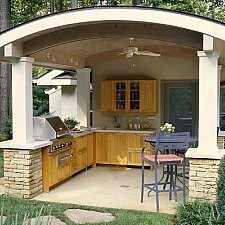 Grill carts are perfect for circumstances when neither a full scale outdoor kitchen nor a BBQ Island is feasible. 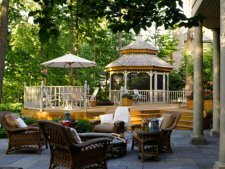 If you are a renter, chances are you can't do anything permanent in your backyard or on your deck or patio. If you are planning a move in the near future, you may not want to invest the time and / or money. 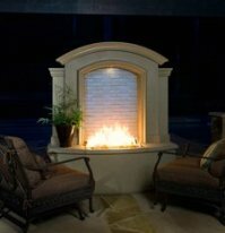 Is your outdoor space limited? Maybe there is some other reason that you need the convenience of a mobile cooking area. Maybe it's just that your budget won't allow a costlier option right now. Take heart - there is a solution for you! If your options are restricted by these or other considerations, perhaps a portable option is best for you. Just because you may not have as many options doesn't mean that you have to settle for nothing. 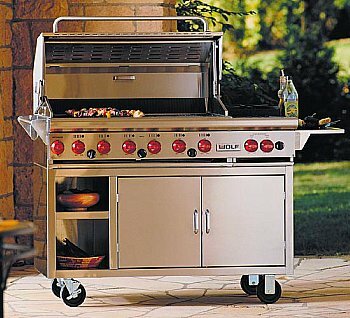 There are a wide variety of BBQ grill carts and one of them is sure to fit your situation. 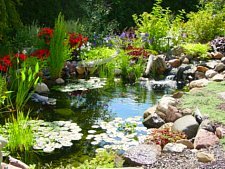 Of course, you will not get the same amount of storage or countertop space as you would with a larger option, but you can still get enough of those things to make do very nicely. 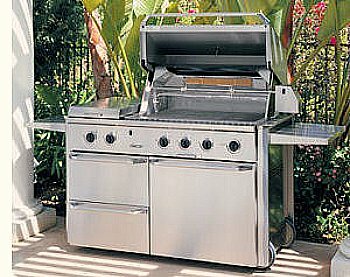 What Should You Look For in a Grill Cart? First, make sure the cart is well made. Look for 300 series stainless steel for the longest lasting, low maintenance benefits. 304 stainless steel is common and is an excellent choice. Welded seams and joints are another sign of quality and will last longer with fewer problems than bolted or screwed models. You can find carts made of redwood or cedar. They look nice, but will not hold up as long as stainless steel and will require more maintenance. Since the idea here is portability, let's take a quick look at the part that creates the portability - the wheels. Some of these portable grills are quite heavy, so the wheels are important. The larger the wheel, the easier it is to roll the grill. At least two of the wheels should have a locking mechanism on them, to keep them from rolling when locked. You want the grill to move only when you want it to, not while you're cooking. Some models don't have an enclosed back. While that saves money and weight, it does limit where you place your grill (you don't want the interior exposed) and it does not provide as much protected storage space. Speaking of storage, keep in mind that a big chunk of the interior storage will be taken up by the LP gas tank, so more is better. Some models have a slide out tray for the LP gas tank, which is a nice feature. A full tank is heavy and it's much easier to put it in place and then slide it into the cabinet. Storage drawers are another handy option. Most grill carts come with cabinet style storage, but drawers are better for storing tools and utensils. 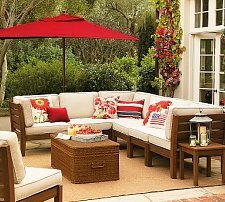 If your outdoor space is limited, be sure to measure your space before buying a grill cart. Be sure you have enough room to put your grill where you want it. 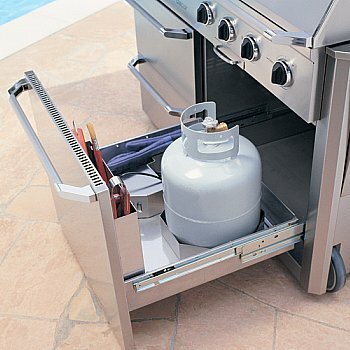 Most larger grill carts have side shelves, either on one or both sides. Often, one of those shelves holds a side burner. An extra burner is nice, but if you won't use it, the countertop space is sure to get used. Some of the higher end grill carts have warming drawers. These are great for warming rolls or for keeping prepared food warm while eating or while cooking other dishes. Take time to determine which features you need, how much space you have, and how much you can afford. With those guidelines, the best options should become more apparent. If you already have a grill, but need more storage and / or countertop space (and who doesn't?) there are carts for that as well. It's always nice to not have to carry everything in and out every time you use your grill. Carts are an effective way to gain storage space and preparation space without spending a lot.